Here you could taste the best bread in Berlin as well as delicious focaccia. Coming soon also pastries, cakes and Italian specialties. Genoese focaccia, pizza alla pala (it is cooked on refractory stones that’s why it is put in the oven with a shovel),maritozzi (typical Italian dessert), bread made with the finest flours and sourdough: these are only some of the tasty specialties that Sironi offers. All these products are made with high quality ingredients and they are carefully selected to fully satisfy your tastes. In 2013 Alfredo Sironi brought the art and craft of bread to Berlin and since then his fresh bread smell emanates everyday from his bakery throughout Markthalle Neun, in Eisenbahnstrasse 42. He grew up in his parents’ restaurant, that’s why his passion for cooking already started when he was a child. 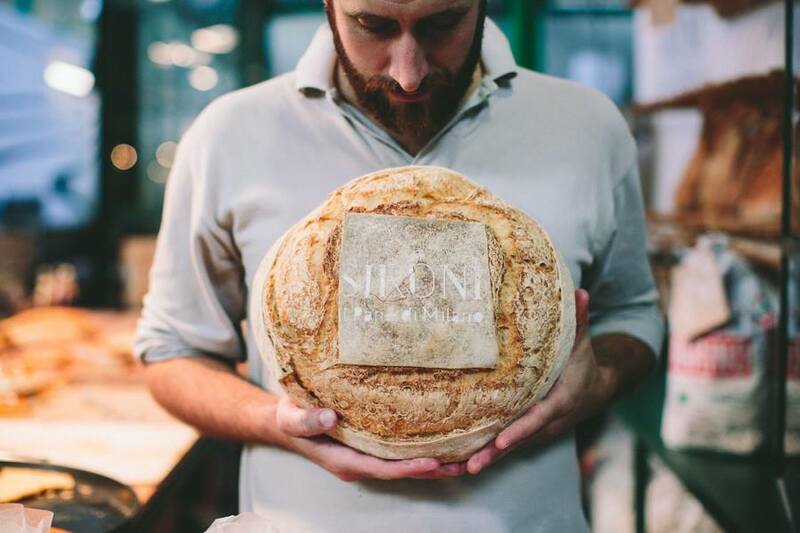 After having decided of specialising in bread and risen products, Sironi moved to Berlin where today every Berliner knows his name as a synonymous of quality and goodness. “After having graduated in History, in 2011 I arrived in Berlin with the idea of starting my own business; then I started learning German and meanwhile I looked for a good place for my business. In Italy I attended some bread making courses even though I had grown up in my parents’ restaurant located between Milan and Como. I studied with some of the best Italian bakers like Giuliano Pediconi. I wanted to bring to Berlin the bread art and craft tradition and make people know it. For this reason I decided to open a bakery where I could have baked bread in view, so that clients could have seen by themselves what we use to make our bread. Here in Berlin it’s difficult to find authentic artisan bakery able to serve a good and genuine product. I only use quality flours and sourdough for my bread, that’s why you can immediately feel the difference with other types of bread. We also produce authentic Genoese focaccia, pizza alla pala, , maritozzi and during Christmas time and Easter time we make panettone and colomba (Italian Christmas cakes). Open Monday to Friday from 8am until 8pm, on Thursday from 8am until 10pm and on Saturday from 8am until 7pm.